Staff members from Unit 71 Medical ICU at Emory University Hospital Midtown work together to improve patient outcomes in the critical care setting. The American Association of Critical-Care Nurses (AACN) has awarded the nursing staff on Unit 71 Medical Intensive Care Unit (ICU) at Emory University Hospital Midtown with a bronze-level Beacon Award for Excellence. The accolade recognizes unit caregivers who successfully improve patient outcomes in the critical care setting and align practices with AACN’s Healthy Work Environment Standards. 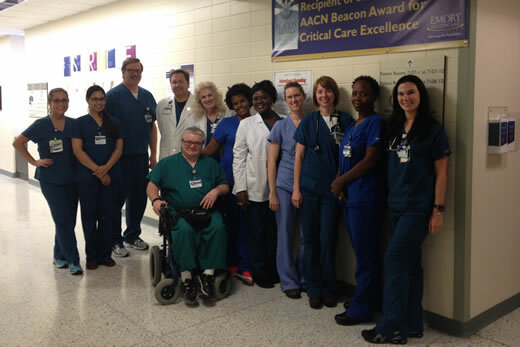 This is the second Beacon Award designation that 71 ICU has achieved; the first one was received in 2010. Units that earn this three-year, three-level award with a gold, silver or bronze designation meet national criteria consistent with Magnet Recognition, the Malcolm Baldrige National Quality Award and the National Quality Healthcare Award. There are only 10 Beacon-awarded units in the state of Georgia, with four of them located at hospitals within the Emory Healthcare system. "I am so proud of our team for achieving this level of excellence in caring for our patients and their families," says Debbie Barker, BSN, RN, CCRN, unit director of 71 Medical ICU at Emory University Hospital Midtown. "Our success is based on intense collaboration and a lot of hard work by the 71 ICU staff and multi-professional team, which in turn, has boosted our quality metrics and patient satisfaction scores, while lowering our infection rates." Unit 71 Medical ICU is a 20-bed unit staffed by almost 65 employees. Eighty percent or more of the nurses on the unit have Bachelor of Science degrees in Nursing (BSNs) and 30 percent of those nurses are certified in critical care. "Obtaining specialty certification and boosting one’s experience in a critical care setting indicates a dedicated team that is committed to delivering the highest quality of care to our patients," says Jim McMurtry, MSN, APRN-BC, CCRN, clinical nurse specialist in Medical ICU at Emory University Hospital Midtown. "This designation also validates that we have a reliable and verifiable quality platform that places us on a correct course for continual quality improvement in the service of our patients." Bobby Wright, MSN, RN MBA, specialty director of critical care services at Emory University Hospital Midtown says, "By achieving a second Beacon award, Unit 71 has really perfected its skill in caring for patients and supporting members of the team. I am impressed with the team’s extreme dedication to our patients and their colleagues and peers." "For patients and families, the Beacon Award signals better care, improved outcomes and higher satisfaction while hospitalized," says Tawanda Austin, MSN, RN, NE-BC, chief nursing officer at Emory University Hospital Midtown. "For the nursing staff receiving the award, the designation highlights a collaborative team effort with an emphasis to create a supportive work environment for our nurses and other team members."